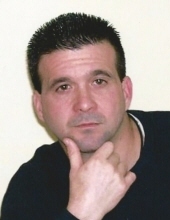 KEVIN G. WEDGE – Age 53, died unexpectedly Sunday at his home in Topsham, VT. He was born in Somerville, July 11, 1965, a son of Richard W. and Louise I. (Ramey) Wedge and was raised in Billerica and has lived in Vermont for over 30 years. Kevin graduated from Billerica Memorial High School Class of 1984 and then entered the military and proudly served in the U.S. Army. He was the founder and owner of Action Construction in Vermont a roofing and siding company. Besides his parents, Kevin is survived by children, Alisha Wedge of White River Junction, VT, Heather Young of Manchester, NH, Devin Wedge of Woodsville, NH and Rachel Wedge of Groton, VT; his brothers, Richard Wedge of Dracut and Gary Wedge of Billerica; his sisters, Michele Cayer of Billerica, Denise Wedge of Lowell and Lisa Ames of VT and his grandchildren, Gabriel Randolph, Sebastien Anastacio and Piper Grant. WEDGE – Of VT, formerly of Billerica, Kevin G. Wedge, A visitation will be held Friday at the Sweeney Memorial Funeral Home, 66 Concord Rd., Billerica from 9-10 a.m. A Funeral Mass will be held at St. Theresa Church, 466 Boston Rd., Billerica at 10:30 a.m. Relatives and friends respectfully invited. Burial in Fox Hill Cemetery, Billerica. "Email Address" would like to share the life celebration of Kevin G. Wedge. Click on the "link" to go to share a favorite memory or leave a condolence message for the family.